Tungsten wire possesses characteristics which have provided it with a unique place in the origin and growth of the lamp industry. 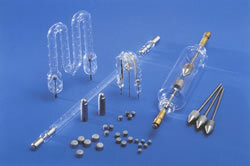 The lamp industry represents the largest commercial application of tungsten wire. It is used in this application because it displays excellent creep resistance at elevated temperatures. Tungsten is an attractive lamp filament material because it has an extremely high melting temperature (~3,695 K) and a low vapour pressure at high temperatures. Tungsten is also intrinsically brittle and, initially, this prevented the manufacture of tungsten wire. However, at the beginning of this century William Coolidge, working at the General Electric Company, pursued the idea of deforming tungsten at elevated temperatures in order to make small diameter tungsten wire. Two important findings of his work were, first, to develop a method to work a powder metallurgy ingot down to wire by using deformation at elevated temperatures; and, second, to produce a ductile material from this deformation. Today, the ability to handle tungsten wire and coil filaments without breakage is the backbone of the whole incandescent lamp industry. Tungsten wire is used in many different types of incandescent lamps. The most common types are the general household lamps, automotive lamps, and reflector lamps for floodlight or projector applications of tungsten wire. There are also many thousands of speciality lamps, which have a broad range of tungsten heater applications, such as audio-visual projectors, fibre-optical systems, video camera lights, airport runway markers, photoprinters, medical and scientific instruments, and stage or studio systems.